This is the third of a three-part series on ‘what we talked about at ISA’. The first part on technology in International Relations can be found here. This second section on the decline of cognitive mapping is here. This final section covers the example of a particular technology being used to overcome deficiencies in cognitive mapping. (For the theoretical context, it’s well worth reading the second part of this series.) Much of the empirical research for this section stems from the work of Patrick Meier and others involved heavily in crisis mapping. Patrick’s website is a stellar resource for the changing digital nature of humanitarianism, and is highly recommended. In the wake of the recent Haitian and Japanese earthquakes, the devastating tsunami in the Indian Ocean, and other major humanitarian disasters, increased global attention has been paid to the ways in which actors involved in humanitarianism can and should evolve to deal with these emergency situations. Media, international organizations, and non-governmental organizations have all reflected on the implications and path forward for managing crises, with a wealth of reports emerging in the wake of this decade’s crises. A similar set of complex crisis situations has become significant recently with the political events currently surging across the Arab world. While analytically distinguishable from humanitarian crises, these political crises share many common aspects and often blur at their boundaries. Political crises typically produce humanitarian crises, while humanitarian crises often stretch the capacities of political actors. The result, in either case, is a situation characterized by its complex and fast-moving nature. Moreover, in both instances there is often a dearth of reliable information. If effective political action is premised upon the conceptual representations of a situation, then rational action becomes nearly impossible in crisis situations. In this regard, the new technologies involved in ‘crisis mapping’ can be seen as a means for political actors to overcome this cognitive gap. Through this case study it can be demonstrated how political actors are in fact constructed not only socially, but also through material technology. First, a little history. The possibility of Twitter revolutions and crisis mapping has been grounded upon the recent spread of mobile technology throughout the developing world. The past decade has seen a rapid and pervasive diffusion of technologies – significantly, not only at an elite level, but also at the most general levels. There are over 4 billion mobile phones in operation, at a level of 61 for every 100 people. Over a billion people now have access to the internet, and both of these numbers are continuing to grow rapidly. More importantly, they are spreading quickest in developing countries – areas that are now leaping over the need for fixed infrastructural systems. What this has meant is that technology now permeates many everyday social relations to an unprecedented degree. The world we live in can no longer (if it ever could) be considered a solely social sphere, disconnected from the materiality of the physical world and the implication of technological objects in the organization of human relations. In terms of crisis situations, one of the most promising of these new technologies is termed crisis mapping. 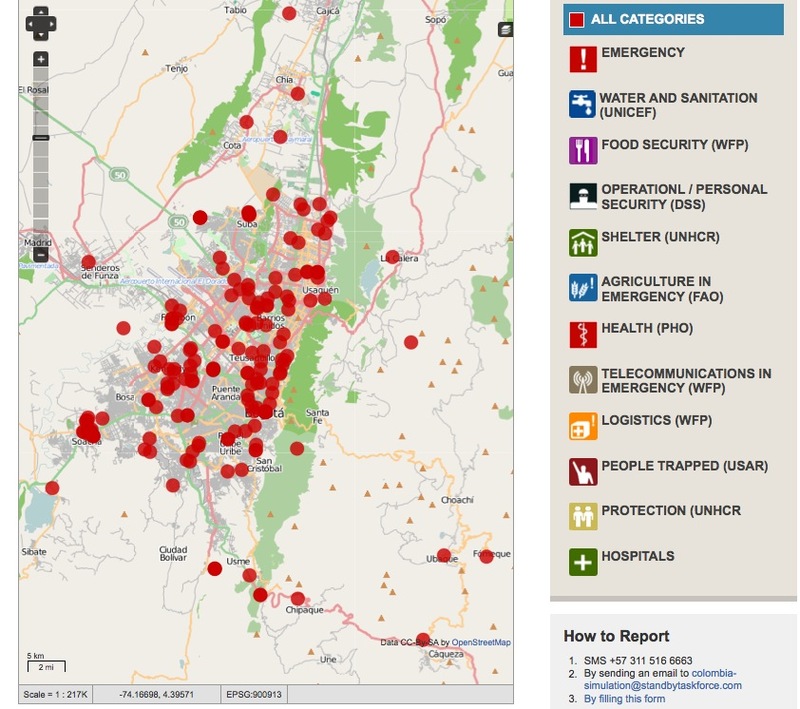 The software of crisis-mapping (most famously, Ushahidi) allows individuals to submit reports to a centralized computer system. It aggregates information from SMS text messages and Twitter reports into a Google Maps-based geographical representation. It was originally developed by Kenyan bloggers in 2007 and used during a post-election period of violence there. As of 2009, it had “since been used in Afghanistan, Colombia, the Democratic Republic of the Congo (DRC), Gaza, India, and Lebanon, and […] Mozambique.” More recently, crisis mapping has manifested in Liberia, Sudan, Egypt, and the ongoing Libyan situation. While the focus here will be on the technological aspects, to be clear, crisis mapping also involves the efforts of numerous individuals (for instance, an institutionalized volunteer grouping has recently been established). The approach here, however, is to examine technology as it is implicated within these social networks. The question is what function does technology carry out, and how does it produce new capacities for cognition and action that are unthinkable without the introduction of this new technology? In this regard, one of the unique aspects of crisis mapping is its linking together of real-time information with geographical representations. It is also unique in opening up the production of information beyond just a small group of designated individuals. 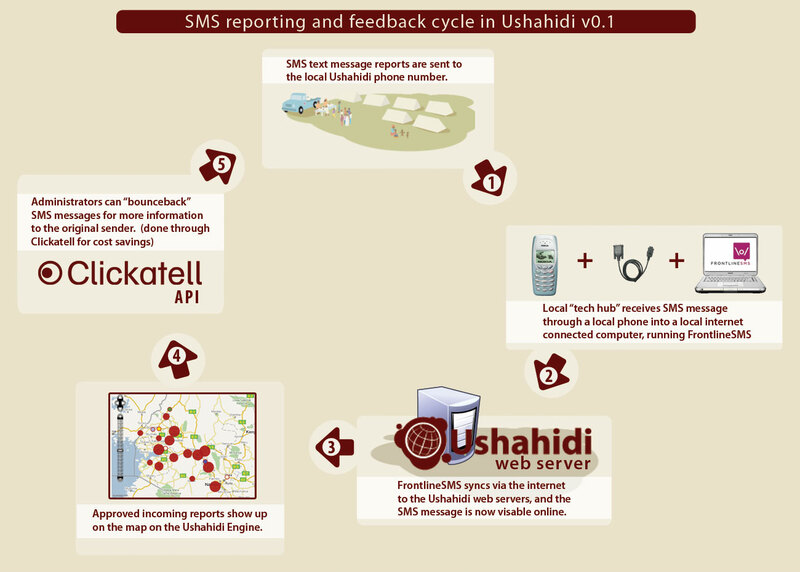 Anyone can potentially submit information to Ushahidi – a situation which makes it quicker and more wide-ranging than traditional sources of data, but which also opens it up to certain problems as will be shown later. This information varies from crisis to crisis, but encompasses a wide range of events. The Libyan crisis map, for instance, includes “updates on military actions, evacuations, movement of refugees, and street fighting.” A simulated earthquake exercise aggregated information on food, water, shelter, health and medicine resources, people trapped and the location of functioning hospitals, among others. Finally, crisis mapping also closes the circle between sender and receiver. Beyond simply receiving information, crisis mapping also sends information to those who subscribe to its free service. By virtue of opening up information supply to a much wider range of actors than is typical of humanitarian agencies, crisis mapping’s most serious problem has become how to ensure the validity of incoming information. Rumours and deliberate lies can be just as easily spread as accurate information, and the often anonymous nature of reports makes verification difficult. A number of means have been developed to lessen this difficulty, including the use of photographs as visual evidence, the use of multiple reports to corroborate claims, and the use of consciously ‘bounded’ sets of information producers. In this latter case, rather than allowing anyone to submit, only specific individuals are used as trustworthy sources. The reputational status of actors becomes a key variable here – that is to say, the linkages within a social network (which belies any technological determinism). More difficulties with crisis mapping arise in certain crisis situations where there is the issue of information being used against the sender – the Sudanese and Iranian governments, for instance, have used technology to trace back and arrest people sending information. 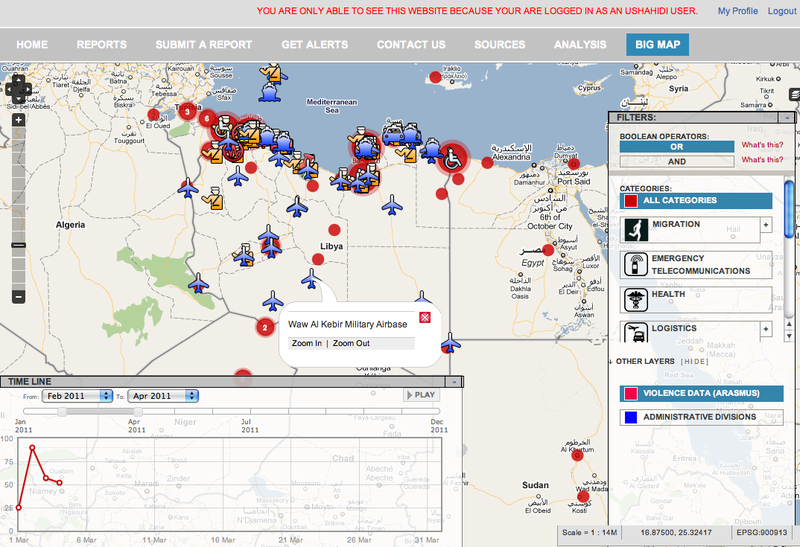 Libyan crisis mapping information has been open in real-time to only a select group of people, with information becoming publically available only after a 24-hour delay. Between the risk of information being misappropriated and the difficulty in verifying information, a number of tensions arise that are in fact intrinsic to the nature of crisis mapping. In other words, they can be mitigated, but not eliminated. Specifically, there is a tension in crisis mapping between the necessary publicity of the information, the secrecy of the sender, and the simultaneous need to verify the validity of the sender. A further complication arises with the tension between the need for real-time information, and the delay it takes to verify information. Taken together, any one of these tensions can be resolved to an appropriate degree, but not all three at the same time. Despite these difficulties and after some initial hesitations, there has been a quick acceptance by humanitarian agencies of the role of crisis mapping in providing information. While Haiti was a largely ground-up effort, by the time of the current Libyan crisis requests for crisis mapping were coming from the UN Office for the Coordination of Humanitarian Affairs (OCHA) itself. The added value of crisis mapping as seen by these humanitarian agencies comes from the capacities it permits for communication and coordination in the midst of a crisis. Crisis maps have also been used to prioritize the use of resources, as well as to map out possible health centers in the midst of disasters like the Haiti and Japanese earthquakes. Foremost is its ability to allow for real-time coordination – not only of organizations and their relief efforts, but also of individuals in the affected communities. In terms of existing humanitarian organizations, it allows for a clearer picture than ever before of the situation on the ground. This means a more effective and efficient use of finite resources, as well as a potentially quicker response to the situation. As the technology melds into the existing assemblages of humanitarian organizations, it is likely that it will transform current practices in order to make even more effective use of crisis mapping. One of the more interesting contributions of crisis mapping is the shift away from top-down humanitarian assistance as has been typical, and towards ground-level self-organized assistance. Individuals within the affected communities can be matched up with medical resources nearby, with food and energy supplies lost in the confusion of a crisis, and with family members and friends who have been separated by the crisis. With crisis mapping information usually available publicly, there is a new resource for those in the midst of the crisis to organize themselves. Rather than information travelling up from those on the ground to those at the highest levels of humanitarian groups, with crisis mapping information travels horizontally amongst the community members. 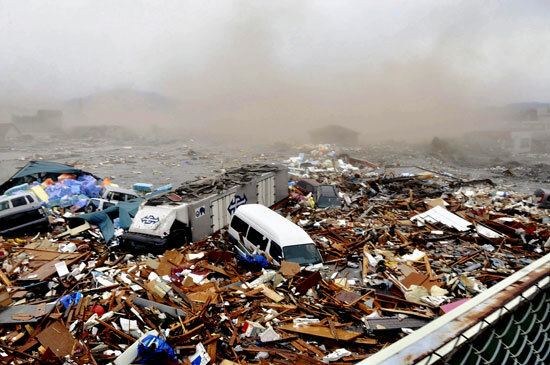 Further developments in crisis mapping software are increasingly automating specific functions and making use of computing power to achieve actions unattainable by humans alone. For instance, the data from crisis mapping is now being combined with data analytics software and data visualization programs like SwiftRiver. This includes, interestingly enough, the use of analytics and tagging in order to automatically compare incoming (unverified) information with previous (verified) reports – allowing for some mitigation of the accuracy problem. This involves what Edwin Hutchins has called distributed cognition, i.e. the offloading of calculative processes to some sort of technology. In this case, the initial analysis of the accuracy of a new piece of information is being automated and judged by a piece of software rather than a human user. This is not to discount the continued role of individuals in verifying information though, as other features of this software include a simple voting system that allows users to collectively judge accuracy. There are further developments in progress that will allow for this data analysis to be combined with software that automatically determines the location focused on by news stories, as well as sentiment analysis which monitors emerging trends in news stories and user reports. Other technical advances are automating the categorization of incoming reports, and the translation of material as well. All of these technical developments are applications of statistical techniques that uncover otherwise imperceptible patterns in the real-time flow of data. In conclusion, it has hopefully been demonstrated that crisis mapping is not simply a replacement of existing human capacities, nor is it reducible to human interpretations of it. Instead, crisis mapping is an independent factor in its own right which is now altering how crisis situations are perceived and responded to. It is transforming the sociotechnical assemblages of humanitarian crises. For example: the 2005 report from the International Red Cross and Red Crescent, World Disasters Report 2005: Focusing on Information in Disasters; the UN Global Survey of Early Warning Systems, and the massive mobilization of the media for Haitian disaster relief. Coyle, Diane, and Patrick Meier. “New Technologies in Emergencies and Conflicts” p. 5. Coyle, Diane, and Patrick Meier. “New Technologies in Emergencies and Conflicts” p. 23. Coyle, Diane, and Patrick Meier. “New Technologies in Emergencies and Conflicts” p. 14. Coyle, Diane, and Patrick Meier. “New Technologies in Emergencies and Conflicts” p. 15.